Posted by Peter Sweeney (@petersweeney) & filed under on June 26th, 2013. Conversational media such as Twitter is sparse and fleeting. These environments impose huge challenges for big data solutions. Imagine if each individual tweet’s meaning could be profiled using a rich interest graph, comprising hundreds of semantically related terms representing the user’s intent. The interest graph representing the tweet could act as a lens, allowing you to recommend and promote related content. 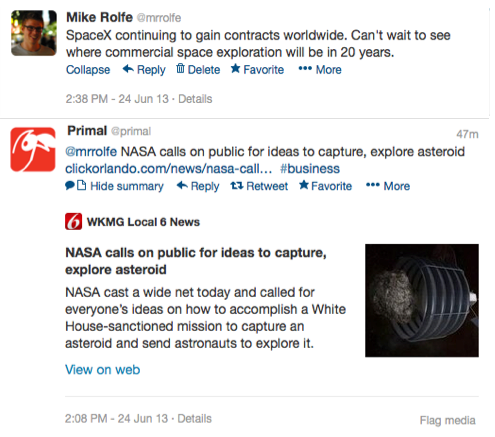 The tweets are transformed from sparse messages to rich, monetizable media. We will now walk through this solution. It assumes you have no preexisting knowledge of the user, only the tweet itself. For each tweet, we’ll use Primal to create a unique interest graph and then filter relevant content from your desired content sources, ready to be presented in that user’s Twitter feed. Interested in building your own solution? Get started with a free Primal account. In order to truly understand my interest associated with small data such as a tweet, Primal will work with topics of interest. To formulate the proper input to Primal we will need to extract these topics from the actual tweet. To do so, you simply have to point Primal to the message or user profile with a URL reference. Alternatively, if the message is private, you can send Primal the text (over our encrypted connection), or simply provide a set of keywords that identify the subject matter. Below is a visualization of the interest graph Primal automatically created from my tweet, as well as some terms associated with this interest that are pulled out of the graph. Notice that my interest graph includes topics such as Elon Musk, the world-famous entrepreneur and CEO of SpaceX, the planet Mars, and Virgin a rival company in the commercial space exploration market. These are all terms that are relevant to the interest expressed in my tweet and are now found (along with many more relevant terms) in my newly created interest graph. Effectively, the sparse tweet has been transformed into a much more expressive and robust media item. This makes the challenge of recommending and promoting related content in the subsequent step much easier to accomplish. Content can now be filtered through the interest graph of my individual tweet. Instead of matching keywords without any context, there is a rich and expressive interest graph which represents the interest expressed in my tweet. For this example we’ve created a Twitter account that responds with a tweet containing a link to the content associated with your interest graph in the previous tweet. See an example below of my interest graph at work. My interest graph was able to surface a relevant piece of content about NASA’s call for new ideas to capture and explore asteroids, a new opportunity that SpaceX has very publicly been exploring. This relevant piece of content was surfaced through the interest graph created above. 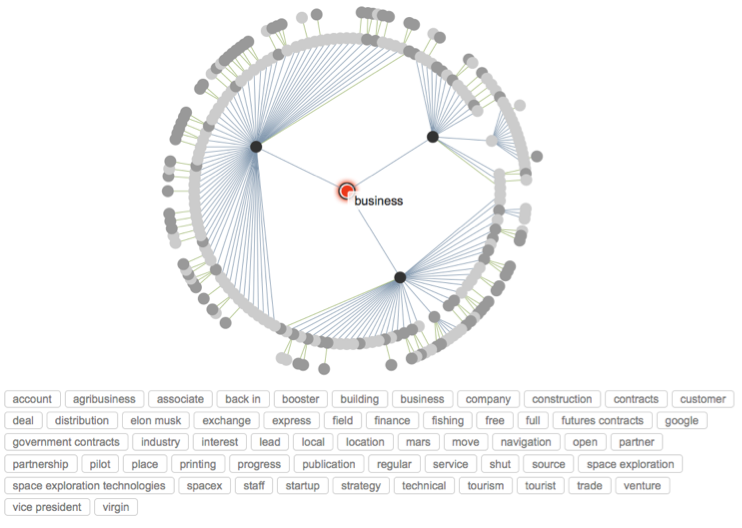 The interest graph has applications to content marketers, advertisers, or third-party applications. There’s nothing creepy about it. No analysis of past user behaviour, no need to persist my user data. Just an interest graph representing what the user really cares about, as expressed in that single tweet. Want Primal to work with your big data problem? Check out our developers site. When you’re ready to dive in, we’re at your disposal to help recreate the walkthrough or explore this use case in more detail. And if you’re interested in working with us directly, we’re hiring!